When you’ve made up your mind to have a baby, you don’t want to have to wait months or even years. But 1 in 3 couples today have trouble conceiving. To improve your chances of getting pregnant and staying pregnant, read this book – the definitive one-stop resource for couples who want to have a healthy pregnancy as soon as possible. Written by the UK ‘s leading expert in women’s health, who has helped countless couples to achieve a healthy pregnancy, this unique book draws on the very latest research to show how a tailor-made plan of action can maximise your chances of conception. 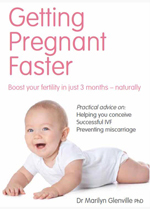 In this ground breaking book Dr Glenville unravels the science, dispels myths and rumours about fertility. If you would like to learn more about getting pregnant naturally then please visit the Pregnancy information page.